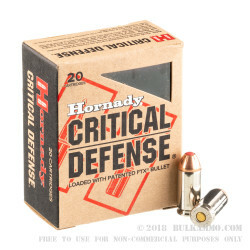 Part of Hornady’s super premium line “Critical Defense”, this .40 S&W ammunition is fast, reliable and clean shooting; with many benefits and value adds built into the load. The real story however is the ultimate reliability and stopping power in a cartridge that has many peers, but few equals. Hornady has been a long time member of the premium producers group in ammunition. 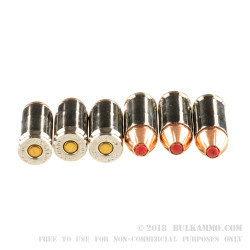 This Critical Defense line represents their current high end self-defense and duty line and offers great penetration for the .40 S&W round which at times has been criticized for anemic penetration. The high velocity load and the consistently mushrooming projectile (the FTX with polymer insert) is a good fit with the reliable feeding of this cartridge. The round has a different bullet profile than most other JHP’s ensuring that the majority of .40 Smith & Wesson firearms can use it without failures to feed. A Nickel plated brass cartridge case and a Boxer primer are a good base for a load that is nearly approaching 10mm numbers for ballistics. The powder charge is lower than a 10mm, but the very respectable numbers make this .40 S&W a strong contender for anyone using the .40 for defense. 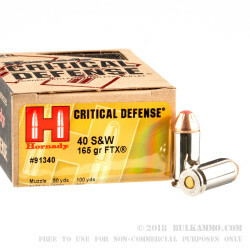 Few loads can compete with the types of ballistics this round can offer in the .40 S&W; it’s indicative of Hornady’s commitment to changing minds about defense ammunition. 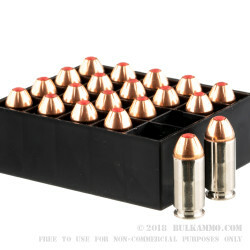 Thisis the best ammo for the value and reliabilty.